This entry was posted on March 11, 2016 at 4:43 pm and is filed under Albuquerque, Bike stuff. You can follow any responses to this entry through the RSS 2.0 feed. You can leave a response, or trackback from your own site. No wonder I don’t recall this road test. It was before I joined Adventure Cyclist. I’ve been writing for them quite a spell now. Six years? Twenty-nine stories? Jeebus. I hope they don’t wise up anytime soon, ’cause I like the work. PO’G: Have you considered gettin’ or testin’ a mountain bike? 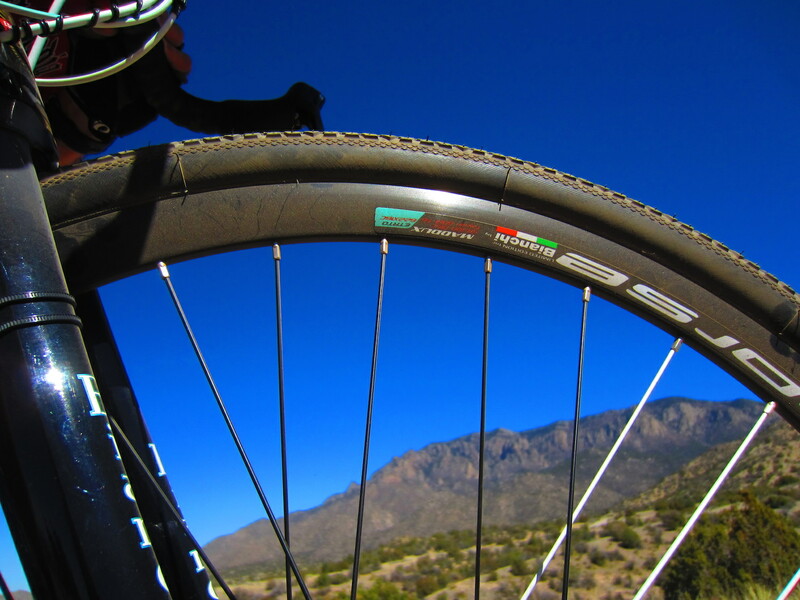 ABQ and Santa Fe have some great MTB trails …. not to mention they’re (the MTBs) easier on the back, make you feel like a 10-year old again (sorta! ), offer an excuse for bringing’ up the back of the pack, and can double as bikepackin’/tourin’ rigs. Groceries? No prob. Stylin’? No prob. Flat shoes? No prob. Etc. Funny you should mention it, JD: I reviewed a Jeff Jones 29er in 2013, and it’s about as upright a ride as Rivendell’s Clem (it’s unsuspended, too). 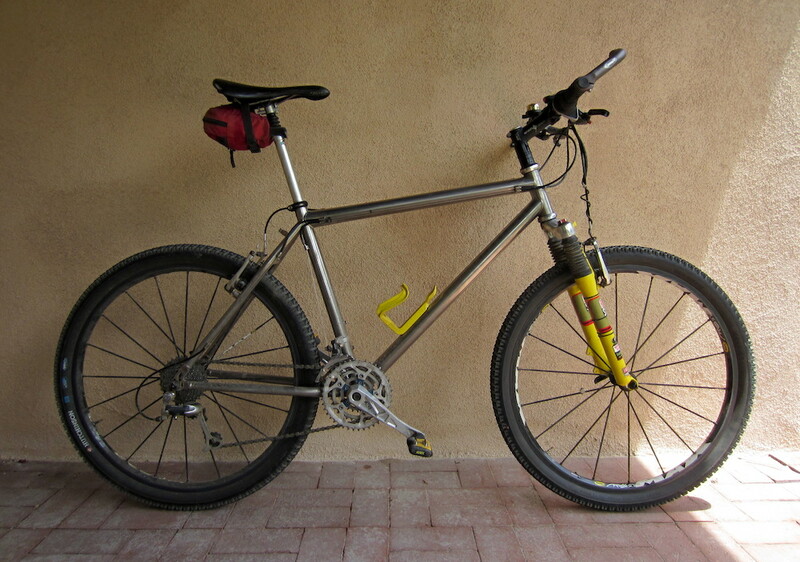 I have a 1995 DBR Axis TT, too, a titanium 26-incher with a rebuilt RockShox Judy SL from HippieTech. But there’s just something about riding a drop-bar bike on singletrack that blows my skirt up. It’s a sickness. Just read the Jeff Jones article (terrific as always, PO’G) and viewed the Axis TT. Some classy looking’ bikes both! My how times and bikes have changed….even in the three years since the Jones article. A “slack 70 degree head tube” in 2013 is now 67 degrees. Almost looked like an early dropper post on the Axis, but I suspect it was a shock absorbing post. ?? Nice bikes…..even better journalism! Gracias! We gave up totally on the Avid banshees. Sandy is now also sporting TRP Spykes (the mountain version of the brake) on her Salsa Ala Carte. We are totally happy with them. And no noise! Even in dusty conditions. I have running them on my Niner for 6 months. I gots to get me some. I’ve had ’em on a review bike and liked ’em. I can live with the BB7s, but the BB5s gots to go. Love this gorgeous photo! Chicago: love trumps hatred, go Bernie!!! Techs I know say they left the O out, it should be AVOID. I sat through a tech seminar awhile back and nothing I saw impressed me much. But heck, I still ride MTB’s now and then with (heavens!) mere 26″ wheels, so what do I know? I usually get the combo prize as oldest guy with the oldest bike anytime I show up to a group thing in the dirt. Hah! “Left the ‘O’ out.” I haven’t heard that one yet. My 26-inch DBR ti’ has ancient Shimano XT V-brakes — it originally came with cantilevers — and my cyclo-cross bikes all have cantis, save for the Bianchi, which is not really a ‘cross bike; more of an adventure bike, gravel bike, all-road bike, whatever the wizards are calling ’em these days. The touring bikes all have cantis, barring the Co-Motion Divide Rohloff. And my road racing bike, which is even older than the mountain bike, still has its original Shimano 600 calipers. They’re the only stock bits on the bike. They work, so why change ’em? I’d like to try Paul’s Minimoto one of these days. I hear nothing but good things, and God knows the Touring and Neo-Retro cantis have stopped me from killing myself more than a few times over the years. The LaCruz has BB7’s. They are not as good as the Shimano hydraulics on the Stumpjumper but for a bike that gets used as a commuter, including occasional diversions down Camp May Road in the summer, they work fine. Only bike I wish I had disks on that I don’t is the tandem. Two people and two V brakes has never been a great combination. Our MTB brakes are V’s, either Shimano or one of the knock-offs. If I rode the things a lot I might could be interested in some newer tech, but for the few times a year we play in the dirt I’m not interested in spending the $$ on new dirt bikes. The old Treks we have in Italy are…well…really old – came with canti brakes and rigid forks dontcha know!!! They’re OK for the rare times we play in Italian dirt. and the time change is this sunday. it snuck up on me. time to shave off the beard i grow in the fall as a protest against the darkness. let the after work rides commence! I can’t remember the last time I went beardless. But then I have a radio face. A little cosmetic facial fur helps those of us so challenged. And a radio voice to match.